Sea creatures move in many ways. Some paddle, some glide, some have fins and swim through the ocean. 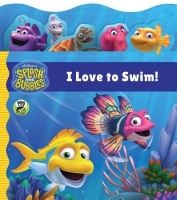 Come explore an array of underwater motions with in colourful tabbed board book, with each shaped tab featuring one of your favorite Splash and Bubbles characters! In the series of books based on The Jim Henson Company's Splash and Bubbles on PBS Kids, Splash, Bubbles and their friends explore the world’s undersea habitats, make new friends and learn about the many different ways life looks and lives in the ocean, celebrating the importance of diversity along the way. Explore how different sea creatures move in the ocean - whether they glide, paddle, or use their fins to swim - in this colourful, rhyming tabbed board book featuring characters from The Jim Henson Company's Splash and Bubbles on PBSKids!